Das ist sauerkraut indeed, little bug. Dig in. Except that there is no such thing as a “german piñata. For my part, I didn’t even knew what a “piñata” was before I read a lot of webcomics. It’s just that boring; you never even knew it existed until it was pointed out. A German piñata. Seriously, Adam, WHAT is inside your head? You’re not wired like normal people. I like that in a person. Does this comment make him the “ultimate” grammar nazi? Not unless he backs up his correction with some sort of war crime. 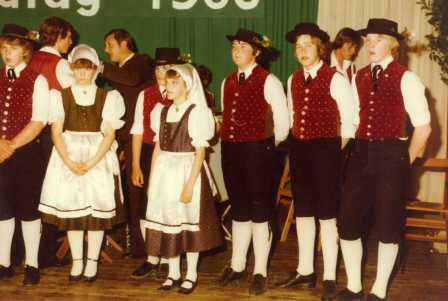 The cliché actually is “South Bavaria is Germany”, as the northern part consist of Franconia and the people there traditionally dress like this http://www.trachtenverein-stadeln.de/resources/Jugendgruppe+1980+Oberferrieden.jpg Please note the obligatory vests rather than suspenders and the covered legs. I laughed sooooo hard right in the first part of the strip that all my colleagues looked up. You will get me fired, Adam, but it will be worth it! You’re such a liar, Adam. Obviously they’re filled with sweet kraut. And be careful what you wish for; Kathy has been known to abduct web comics. Though you seem to be armed with a manilla folder, so I tip the odds in your favor. Unfortunately, your RSS feed is broken 🙁 This comic, and the previous installment, share their ID. Some feedreaders duplicate these two comics on every update because of that. Weird. I know I’ve had long titles with similar names before, but never heard about any problems from those. I went ahead and altered the title. Yes, you are right. Will fix. Thank goodness everything is going digital so we can get rid of those boring manila folders! There’s just no hope for them! OMG! This is too perfect, but… my Grammar Nazi is kicking in. I love your comic nonetheless! Also, I was just trying to eat Müsli when I read this comic and just about snorted milk out of my nostrils. BWAHAHAHA der German piñata… ROFL at all the people being nit-picky about articles or whether or not there are piñatas in Germany. I for one thought the random article before a word, the Bavarian kid, and the funny little sentence were to poke fun at the “German” stereotype? I beg to differ! I’ve got artwork, notes, and drawing reference in my folders. Woo! Kathy Bates! But then, I’m not a guy, so whether or not I’ll ever put her on a folder is irrelevant here. And I’m just here with folders for screenshots and art which most of was done many a year ago.